businesscoachblogger.com » Starting the Day Off. Right. 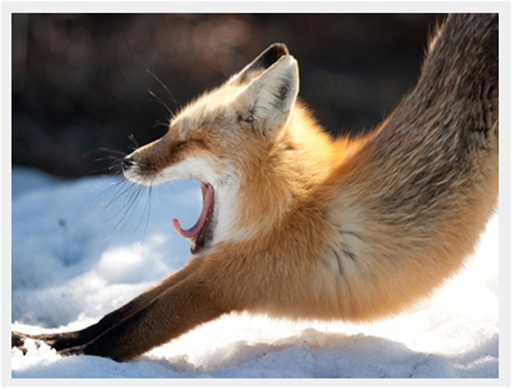 The smart little fox knows there’s nothing like a great stretch to start the morning off right. We can do the same. Not only it is delicious, we can use that stretch as a reminder to take a few minutes of quiet meditation to set the intention for the day. Maybe say a prayer or two to get ourselves into the perfect frame of mind. Invite in all the good we wish to give and receive during our waking hours. So, why don’t we do it? Start our days quietly, peacefully, respectfully? We’ve got to check email. We’re running late for a meeting. The kids need breakfast. We just don’t have TIME. Imagine that. We don’t have time. In more truthful terms, we’re saying we don’t care enough about our internal selves to set aside even a few moments to determine and evaluate the intended purpose of our day. That we’re too busy serving the outside world. How easy it is to take and use that stretch in the morning as a reminder of the most important thing in each day: our own self-care. If we do it each morning, it will change our lives. This entry was posted on Monday, April 9th, 2012 at 1:37 pm and is filed under getting started, New Day. You can follow any responses to this entry through the RSS 2.0 feed. You can leave a response, or trackback from your own site.